Overview - What is ActiveX Control? ActiveX controls are small pieces of software that can be installed in your browser. Most are perfectly harmless and are used by websites to provide enhanced features such as providing support for animations and video. They are also used by Microsoft to assist with installing security updates. 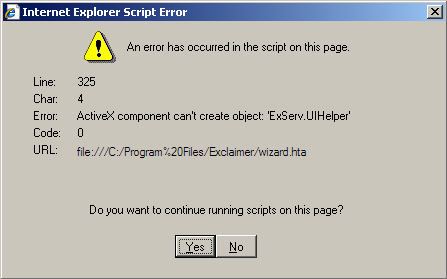 ActiveX controls are similar to Java applets. They are small programs that web browsers download and execute in order to view certain files, display videos and animated files, and they can also be used to collect information. Most ActiveX controls are perfectly safe, but due to their nature they can be used for malicious means. Most browsers have the ability to block ActiveX controls, or allow only those you deem safe, and are from trusted sites. Cannot load ActiveX control successfully. Please reopen this page and accept to install the control. Video ActiveX Object Error: Your browser cannot display this video file. You need to download a new version of Video ActiveX Object to view this video file. Note that any site you don't trust that asks you to download a new version of ActiveX could possibly be fake. The "new" version could possibly be a virus. As ActiveX controls are mainly used in your Internet browser, the first thing you should do if you continue to get ActiveX control errors is to check your browser. Most browsers allow you see which ActiveX controls are installed, and if you find you get errors mainly when opening one type of file, (such as an animation or video file), then this will give you a clue as to where to look. Failing that, you could try viewing the same file in a different browser to see if the same issue occurs. Using Windows System Restore, select a date when you know your computer was working correctly to put your computer back to a previous configuration. If you decide to do this, you should uninstall your browser, and then reboot and run Windows stability scanner before reinstalling your browser again. This will ensure all unnecessary files, folders, and registry entries have been completely removed. Some viruses can attack your computer if you've downloaded a malicious ActiveX control. Make sure you've completely updated your virus scanner and do a full scan. Just like viruses, malware and malicious software can play havoc on your system if downloaded accidently as an ActiveX control. Update your malware scanner and run a full scan.